Many moons ago, and as a novice collector of porcelain, I thought that the phrase “Chinese Export Porcelain” meant to include all items imported from China and primarily copies or imitations of European & American Pottery. 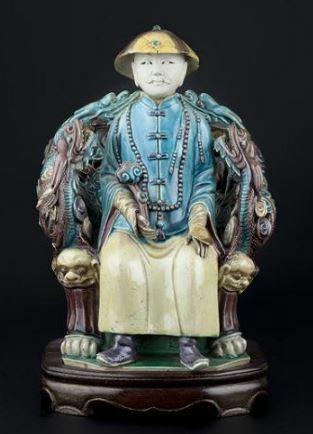 After reading several articles and books on the subject, and having visited numerous Decorative Arts museums or private collections, I came to realize that this term is reserved for a much older line of porcelain wares, made in China, that actually were once the envy and basis of European porcelain makers to imitate, not the other way around. 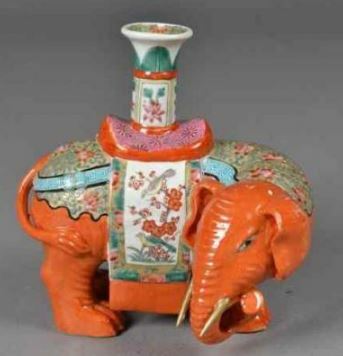 Chinese export porcelain has attracted the interest of a growing number of collectors on a worldwide basis. Nowadays, auction houses in major cities around the world regularly schedule sales devoted exclusively to Chinese Export Porcelain. Prices vary depending on age and decorative appeal, provenance and of course condition, and seem to keep escalating all the time. A notable activity that has helped in this rapid appreciation lately, has been the strong desire by Chinese investors and collectors, who not only can recognize precious pieces and distinguish them from the recently mass-produced items that have flooded the market since the 1960s, but who also want to preserve and perhaps reclaim some of this grand nation's heritage. Historically, while Chinese Porcelain exporting dates back to the early part of the 16thC, interest went down drastically ca 1850s – 1900, a period when imports to various Western countries virtually came to a halt. So much so was this the case that a major English authority on porcelain marks, William Chaffers, in his first edition of Marks and Monograms on European and Oriental Pottery and Porcelain (1863), erroneously identified this porcelain as having been made at a small factory in Lowestoft, UK. This attribution was made despite the fact that hundreds of thousands of pieces, still existing at the time, had been imported into England for many years prior to 1756 when the little Lowestoft works were established. The factory ceased to exist in 1802. Chaffers' erroneous attribution had one unfortunate effect: it was accepted as the gospel truth. Consequently, this pure Chinese porcelain has been called Oriental Lowestoft or Chinese Lowestoft for almost one hundred years, causing considerable confusion to Antiques Dealers and Collectors alike. Today the term Chinese export porcelain is considered an accurate one since the porcelain was made in China, it was made for export, and it is true hard paste. This term has now been adopted by practically all leading international Auction Houses and Galleries. We have also taken extra steps in our attributions of related marks and items on our Marks4Antiques.com databases. 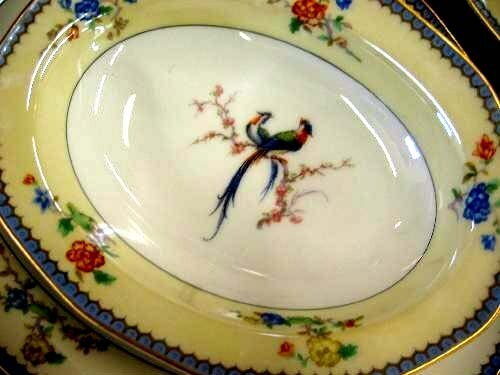 It is important to note that at no time did this porcelain have a generic name in the manner of Bow, Chelsea, Spode, or Meissen, which took the name of the factory or town where made. Before Chaffers, Chinese Export china was referred to as India Company china in England. The manufacture of Chinese porcelain goes back a number of centuries, some experts say as early as 100 BC. According to most historians, Porcelain was made at different locations in China. But it was Emperor Woeng Wu (Ming Dynasty ca 1368 – 1398) who selected the town of Ching-te Chen on the P'oyang River in the province of Kiangsi, to build kilns for the organized manufacture of porcelain, initially destined for the royal palace. Soon afterward, other private factories were established near or around the area and the town was to become known as "The Porcelain City." Ching-te Chen was surrounded with all the necessary elements for the making of fine porcelain. In the riverbed was an excellent quality of white clay (kaolin); in the hills a good quality of feldspar (petuntse) for the glaze, abundant ferns, the ashes of which were mixed with the petuntse to harden the glaze, and pigments for the porcelain. Also in the hills were coal and wood to fire the kilns. In addition, the location on the P'oyang river, near P'oyang lake, gave the town access to a series of waterways and overland trails to some of the major seaports, including Canton, about four hundred miles to the southeast. Over the years the importance of Ching-te Chen grew substantially. In the 18thC it is said to have around 3,000 kilns and a population of a million people. In some ways, the city can be compared with the modern-day auto-manufacturing center of Detroit, Michigan. Practically everyone was engaged in some aspect of the porcelain industry. A type of production line was developed in which each individual had one specific task to perform in the manufacture of a single piece, a method first used in the US much later, in the late 19th C, and which we now believe sparked our Industrial Revolution. Export of Chinese Porcelain made at Ching-te Chen began fairly early. A steady flow of exports, however, did not begin until the arrival of Portuguese merchants at Canton in 1517. When barred from the ports of Ningho and Chuan, the Portuguese established a trading post at Macao. Since 1557 this coastal city has been their private possession. In 1596 the Dutch reached Bantam, and in 1598 a Dutch fleet of eight ships sailed to trade with the Far East. The British East India Company was set up in 1599 and established at Bantam in 1620. In 1698 the first French ship traded with the Far East. In 1699, the Emperor Kang Hsi finally opened the port of Canton to foreign trade and the English established the first hong, or factory, on the banks of Pearl River. They were followed by the French in 1728, the Dutch in 1729, the Danes in 1731, Swedes in 1732, together with the Austrians, Russians, Indians, Armenians, the Spanish Manila Company, and finally the Americans in 1784. The largest number of hongs at any one time was thirteen. They were two or three stories high with the first floor reserved for business and the storing of merchandise while the second and third floors were used for living quarters for the staff. No women were allowed at the hongs and this restriction lasted until after the Opium Wars in 1841. 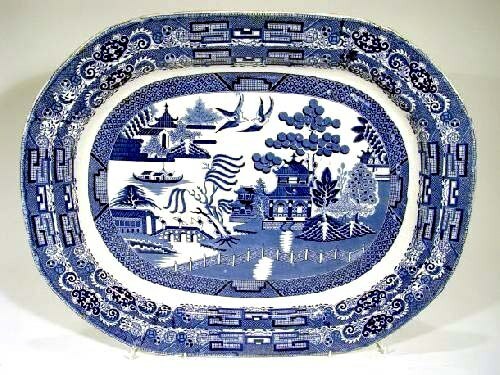 At first with the Portuguese, Spanish, and Dutch merchants all porcelain exported was of the blue and white variety and the forms were largely of Chinese origin. It wasn't long, however, before the trading nations began to order forms and shapes that were more appealing to the European taste. 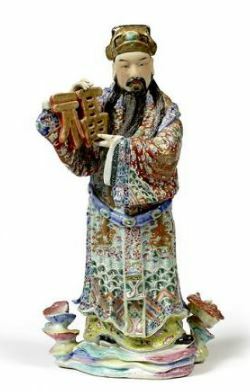 The merchants supplied the Chinese potters with wooden models as well as actual European items in silver, pewter, faience, etc., to be copied in porcelain. As early as 1639, records of the Dutch East India Company show an order for 25,000 items was to be made from wood models supplied by the Dutch. Much Chinese export porcelain survives today in near perfect condition largely because of the extraordinary number of pieces shipped to the major European countries and, after 1784, directly to America. These literally run into the millions. In America, imports increased sharply after the Revolutionary War and again after the War of 1812. In Europe, however, the volume of trade steadily declined during the 19th C, and virtually came to an end when the town of Ching-te Chen was destroyed and most of the inhabitants slaughtered during the T'aip'ing rebellion in 1853. The town and the kilns were later rebuilt, but it never again attained its prominent position in the manufacture of porcelain. However, the principal cause of the decline in the trade is due to the gradual takeover of the porcelain business by English and continental factories. The secrets of Chinese production were mastered, primarily by German and Dutch craftsmen. They were in a good position to satisfy the European and North American customers for two reasons: that of taste and promptness of delivery. Orders taken by the East India companies would generally be two years or longer in filling. English and continental manufacturers either carried the items in stock or could supply them on short notice at competitive prices. At first, it was not easy for the Europeans to copy the glazes and the colors so expertly developed by the Chinese. 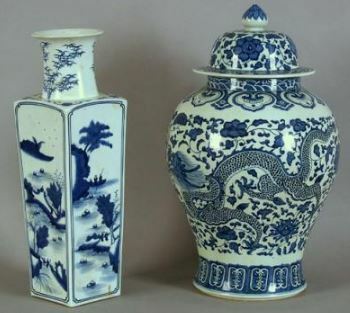 Until late 17th C almost all export porcelain was of the blue and white variety. After the kilns at Ching-te Chen were burned down by warring factions in 1675, they were rebuilt by the Emperor K'ang-hsi and new colors were developed for decoration, most notably Famille Verte (green), and porcelain making reached a very high quality. Soon after, other colors such as rouge-de-fer and gold were developed and the quality of the porcelain reached an even higher level. Later, ca 1730s – 1750s the beautiful Famille Rose colors and decoration were perfected. At the same time, however, during the height of the Western trade, ship captains and managers (or super cargoes) were instructed to purchase pieces of heavier quality to reduce breakage in shipping. Concurrent with this change to heavier (and poorer) porcelain, the quality of decoration began its decline. The coarse heavy porcelain, often with crudely decorated designs, bore little resemblance to that of fine egg shell quality and detailed decoration. New designs were introduced at the end of this period and during the early part of the 19th C. Among them was the so-called Fitzhugh design in blue, green, orange, brown, mulberry, gold, black, yellow, and combinations of colors, and the Rose Medallion design in which a piece is largely covered with large floral medallions in rose, greens, and blues. Other designs introduced at this time include the Mandarin in which the floral medallions enclose Chinoiserie designs in colors similar to those of Rose Medallion, and a design of overall flowers, birds, and butterflies in shades of orange and brown which today is referred to as the Sacred Bird and Butterfly design. Check our research guides to help you in identifying and appraising your own collection at marks4antiques.com.